The Chief of Joint Operations (CJOPS) is a three-star role within the Australian Defence Force (ADF), responsible for commanding operations. Until 2007, the Vice Chief of the Defence Force (VCDF) was double hatted, additionally exercising the responsibilities of CJOPS. However, in September 2007 the Minister of Defence, Brendan Nelson announced the formation of a separate CJOPS position based at the Headquarters Joint Operations Command (HQJOC) facility at Bungendore, New South Wales. Joint Operations Command consists of Headquarters Joint Operations Command and Border Protection Command. The Direct Command Units consist of Military Strategic Commitments Division (incorporating the Australian Defence Force Parliamentary Program); Reserve Policy Division; and the Command and Control Implementation Team. Chief of Joint Operations is a joint position, and in theory the incumbent can be appointed from any of the ADF components. 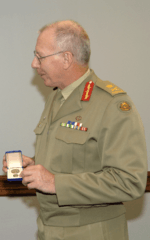 On 28 Match 2014, the Department of Defence announced Rear Admiral David Johnston will be promoted vice admiral and succeed Lieutenant General Ash Power as CJOPS on 20 May 2014. ↑ Minister of Defence Press Release MIN99/07 19 September 2007 Archived 30 July 2008 at the Wayback Machine. ↑ "New Chief of Joint Operations announced". Defence News. Department of Defence. Retrieved 28 March 2014. ↑ "Rear Admiral Steve Gilmore, AM, CSC, RAN" (PDF). Embassy of Australia, Washington DC. Australian Government. Retrieved 21 January 2016.